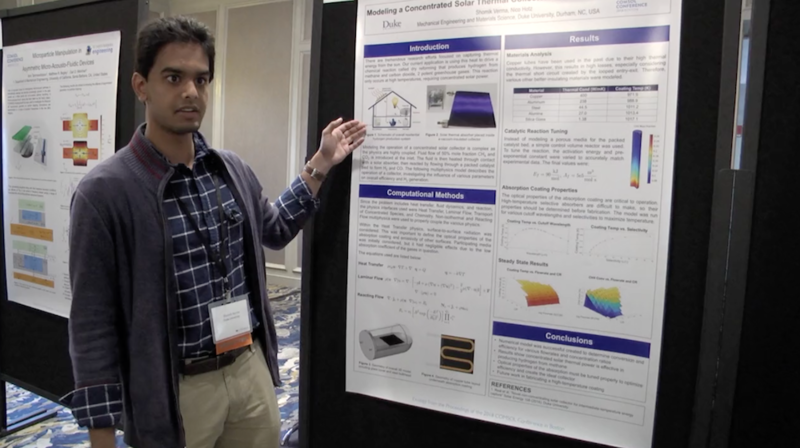 Earlier this month, simulation engineers and researchers presented their papers and posters at the COMSOL Conference 2018 Boston. Six papers and posters were selected to win awards, with top papers determined by a program committee and top posters determined by popular vote among attendees. Read on to learn what made these papers and posters stand out as award winners among many excellent contributions. Nearly 150 users of the COMSOL Multiphysics® software and COMSOL Server™ presented papers and posters in a variety of topics. Although all of the submissions were impressive, the presentations featured here were given Best Paper and Best Poster awards. 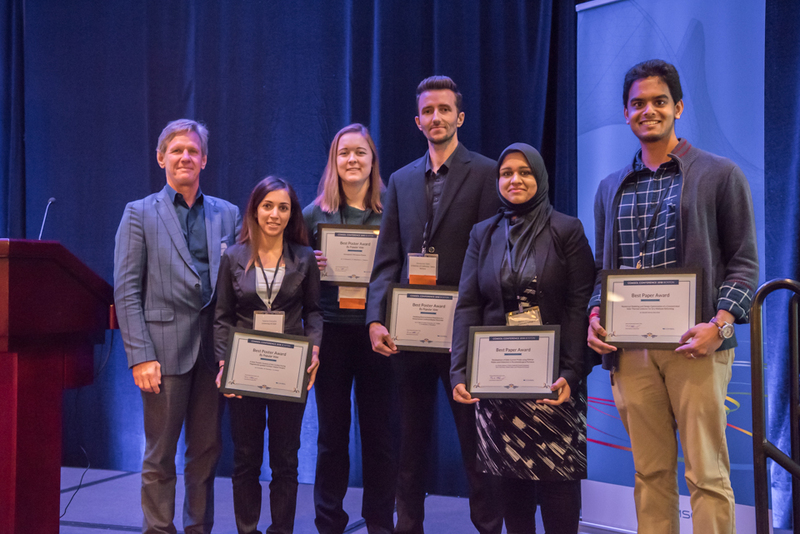 COMSOL CEO Svante Littmarck with the 2018 Best Paper and Poster winners. From left to right: Fateme Esmailie, Tressa Marquardt, Alexander Eden, Aroba Saleem, and Shomik Verma. For this year’s conference, the program committee accepted a wide range of interesting and inspiring papers for oral presentations. Three of them were selected for Best Paper awards. Engineers are turning their attention to hydrogen as potential fuel for the future. Steam reforming currently accounts for 95% of hydrogen production, but it is a rather energy-intensive process, utilizing natural gas combustion for the heat of the reaction. What if solar energy could be used as the catalyst for this process instead, thereby harnessing the heat required for steam reforming more effectively and sustainably? Shomik Verma of Duke University discusses the topic of his research, which won a Best Paper award. In their research paper on methane dry reforming, Shomik Verma and N. Hotz of Duke University developed a design for collecting concentrated solar power, consisting of a vacuum-insulated collector with fluid flowing between two flat plates and a Fresnel lens above to concentrate sunlight. The researchers created a 2D model using COMSOL Multiphysics to evaluate two collector designs. They were able to confirm the physical accuracy of the model, identify the most efficient operating point, and determine the concentration and optical properties. As an essential microfluidic structure for controlling flow, a check valve is often rated by its cracking pressure. Stereolithography techniques that use flexible materials such as PDMS (polydimethylsiloxane) have been demonstrated in numerous examples due to their extremely low Young’s modulus. Researchers A.M. Melvin and T.J. Roussel of the University of Louisville continued this innovative work in their paper on analyzing flexible materials commonly used in fused deposition modeling (FDM) 3D printers. To see if the flexible materials used in 3D printers could work in a microfluidic system to separate particles by size and deliver controlled-volume droplets, the researchers used the MEMS Module to describe the moving mesh associated with check valve geometries. The results indicated that in order to achieve the relatively low flow rates found in microfluidic channels, adequately actuate the valve, and promote forward flow, the valve requires a material with a low Young’s modulus, such as thermoplastic polyurethane (TPU). These promising results will help the researchers optimize check valve geometries to minimize deformations during 3D printing. In the paper “Development of Eddy Current Probe Using FEM for Matte Level Detection in Pyrometallurgical Furnaces“, Aroba Saleem and fellow researchers P.R. Underhill, D. Chataway, T. Gerritsen, A. Sadri, and T.W. Krause at the Royal Military College of Canada designed a new eddy current sensor for the remote detection of molten matte level in a pyrometallurgical furnace. During the smelting process, impurities float to the top of the matte level, so it’s important to monitor the level of molten matte to optimize tapping schedules. Although this process is usually done manually, the researchers’ eddy current sensor design, built using COMSOL Multiphysics, could be used to measure the matte level more accurately and safely. The team defined nine cylinders as numeric coils and modeled these coils as homogenized, multiturn conductors. A constant amplitude sinusoidal voltage was then applied to the drive coil, and a rectangular sheet, split into two domains (air and titanium metal), was placed 300 mm from the coils. Ultimately, the model proved capable of detecting the matte/metal level and slag interface at a distance of more than 300 mm. These exciting results show the potential of the sensor design to safely and accurately measure the matte level by embedding it in a furnace sidewall. Tressa Marquardt, D.F. 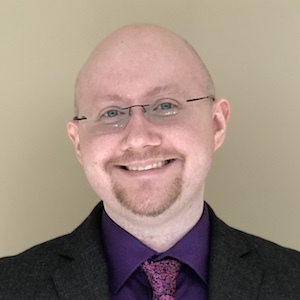 Shewamene, and J.J. Swanson of Minnesota State University investigated approaches to improving the plasma gasification of a biomass system, which can both reduce the carbon footprint of waste disposal and produce renewable energy. They also explored the relationship between microwave power, electron density, and surface temperature. 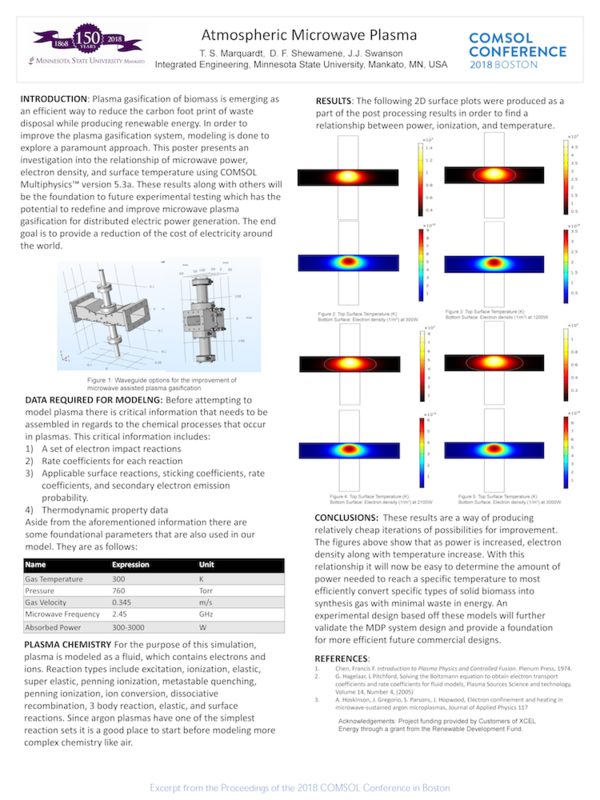 After assembling critical data regarding chemical processes in plasmas and establishing foundational parameters, they set up the plasma model as a fluid based on argon, which has relatively simple reaction sets. The results of the 2D surface plots showed that as power is increased, both electron density and temperature also increase. The team concluded that they can determine how much power is needed to reach a specific temperature, which will allow for the conversion of solid biomass into synthesis gas with minimal waste in energy. 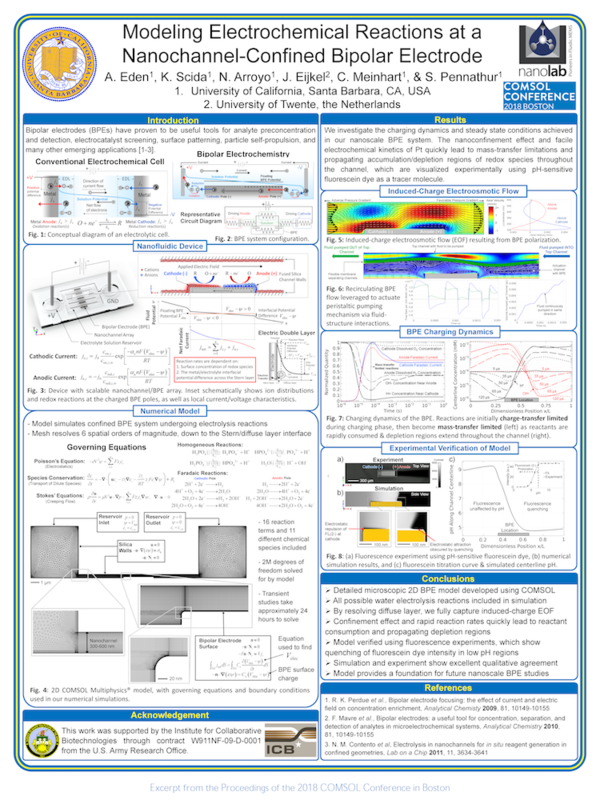 Their poster on atmospheric microwave plasma won an award. Worldwide, there are approximately 450,000 cochlea implant users. Options for inserting these implants are not without risk, including intracochlear physical trauma. New techniques employ magnetically guided, robot-assisted insertion, which reduces the risk of intracochlear physical trauma. However, this method can introduce a new risk: thermal trauma in the magnetic detachment phase. Along with fellow researchers M. Francoeur and T.A. 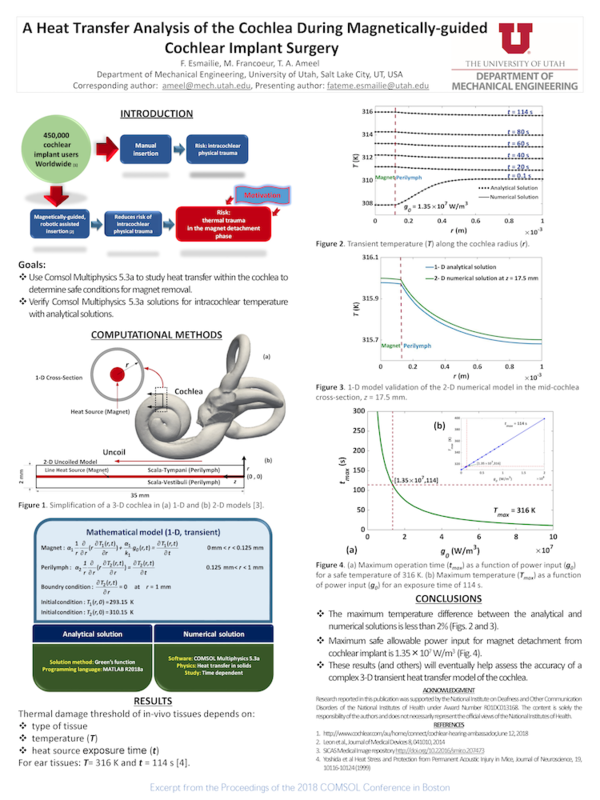 Ameel, Fateme Esmailie used COMSOL Multiphysics to study heat transfer within the cochlea and determine the best conditions for magnet removal. They were able to evaluate an analytical and numerical solution that enabled them to verify model accuracy and determine the maximum allowable power output for safe magnetic detachment from a cochlear implant. Bipolar electrodes (BPEs) are used in a wide variety of applications, including electrocatalyst screening, surface patterning, particle self-propulsion, and more. In order to more efficiently utilize BPEs and expand their application areas, researchers Alexander Eden, K. Scida, N. Arroyo, J. Eijkel, C. Meinhart, and S. Pennathur from the University of California, Santa Barbara, and the University of Twente, the Netherlands, developed a design of a nanoscale BPE system consisting of a nanofluidic device with a scalable nanochannel/BPE array, as well as a numerical model simulating a confined BPE system undergoing electrolysis reactions. The team was able to study a detailed 2D BPE model at a microscopic level and observe all possible water electrolysis reactions included in the simulation. Using COMSOL Multiphysics, the researchers fully captured induced-charge electroosmotic flow and were able to determine that the confinement effect and rapid reaction rates quickly lead to reactant consumption and propagating depletion regions. In addition, they verified the model using fluorescent experiments that showed the quenching of fluorescent dye intensity in low-pH regions. You can experience the welcoming atmosphere of the COMSOL Conference for yourself — and perhaps even win an award! Look out for the call for presentations for the COMSOL Conference 2019 Boston, which will be held on October 2–4.